Carrow Road was re-developed in 1990 when it was converted to being all seated as a result of the Taylor report. The stadiums capacity is 26,034 and with the exception of a supporting pillar either side of the Barclay and River ends, there are very few bad seats in the house. The Geoffrey Watling stand is the oldest in the ground but still offers excellent views coupled with good facilities and leg room. 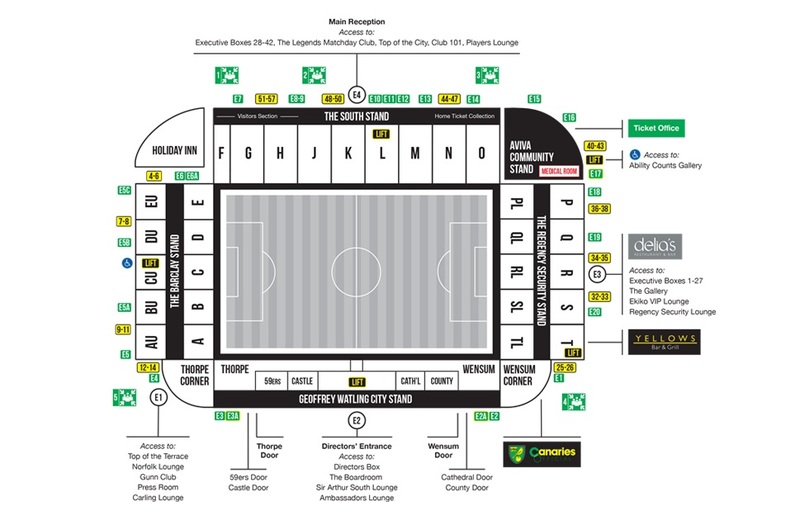 Visiting supporters are situated in one end of the south stand where up to 2,500 fans can be housed. The view from here is excellent and unobstructed whilst the facilities also fill a gap without re-mortgaging your house. If you have time, be sure to try one of Delia's pies. The best pie I've tasted in a long time. The main away fans pub is the Compleat Angler, directly opposite the station. It's a very welcoming pub which actually caters for both home and away fans but always has a friendly atmosphere. They serve a wide range of beers and even a small amount of food. If you have travelled by train and fancy a bite to eat there's a KFC nearby. On exiting the station, go straight over the traffic lights, (over the bridge) into Prince of Wales Road. The Kentucky is about 150 yards down on the right. Parking is available in the streets surrounding the stadium although it is limited and be aware of the residential areas. Private car parks are few and far between here but Norfolk County Hall has space for approximately 2000 cars and is reasonably priced at £3 per car. However, arrive early to get the best spot and to avoid spending a fair while trying to escape after the game. The nearest / closest train station to Norwich City's Carrow Road Stadium is Norwich rail. The ground is approximately a five minute walk from the station but you can't really miss it as the train pulls in. If you were asleep at the time, just turn left and follow the dual carriageway past the car parks and supermarket. Travel: Ooooh this is fun…. 12.45 kick off, we were due to get the coach at 5am…only it left early and went without us! Dash back home, print out directions, steal my mum’s car (well, it had air conditioning and electric windows!) and drive like demons! Then of course as I hadn't checked the guide, I didn’t have a clue where to park so we ended up in some random long say car park miles away from the ground! Getting lost in the woods before and after the game just added to the fun! .. Second time was a bit more straightforward, parked at the County Hall, though not sure I would again with it being £6 and having an irate Father Christmas lookalike stewarding the place and dumping cones in front of everyones cars! Refreshments: The city centre is only about 10 minutes away so take your pick. Went to the Compleat Angler the second time, full of Everton fans, massive, ace location right next to the river …just they charged £1.95 for an orange and soda the cheeky twunts! Inside, I don't have a clue, as we were late getting in first time so they stopped serving us food and drink, resulting in a near riot!Second time, it was ridiculously cramped, meaning I couldn't even get near the bars, so pretty poor for such a new stand. Impressions: The Jarrold Stand was not long opened when we went first time, so seats were great. So long as you're not right in the corner so you're not constantly craning your neck to see sideways! The food area in the ground is too small as well for a fairly new stand. The ground looks a lot smaller than it is, with the City Stand opposite the away end being so small. Decent little balanced ground though. Atmosphere: It was a really end to end kind of game when we went, and Norwich were still looking for their first league win so the atmosphere was all over the place! Rocking early on, then we went 2-0 up so we were rocking while they shut up, they got it back and were pushing us again, we got a late winner to go 2nd in the league so the atmosphere was a bit of a classic to be fair! .. On both visits however, the stewards were an absolute pain about standing from the first minute, and that never helps the atmosphere anywhere. Anything Else: This was the first ground I went to where I heard music after the goals! I hate music after goals, it is as bad as it gets. We were 2-0 up and cruising at half time, then in the first minute of the 2nd half, they got one back. Cue the whole away end putting their heads in their hands… then slowly lifting the back up, looking at each other confused and saying ‘what the hell is this?! ?’ as Samba Di Janeiro belts out and all the Norwich fans in the Barclay End are dancing at us…. Enjoy: Decent ground and away day, the worst thing about it is the distance to be honest. And the police and stewards of course, who your obligatory small town lot enjoying the opportunity to bully a couple of thousand Prem fans, rather than the usual couple of hundred from Crewe! 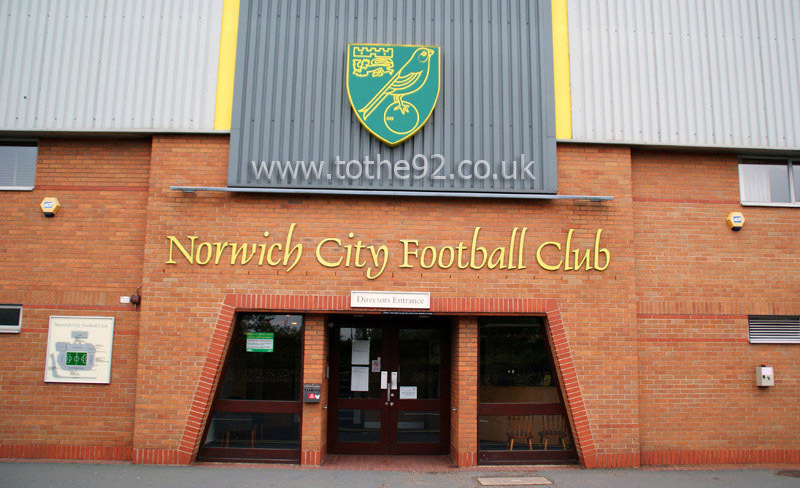 Have you been to Norwich City's Carrow Road? To tell us about your experiences at a Norwich game and to feature on the site, simply complete the fans review form below!